Preet Bharara announced on Saturday that he’d been fired from his position as US Attorney for the Southern District of New York, which includes Manhattan, where Donald Trump used to reside and his wife still does. 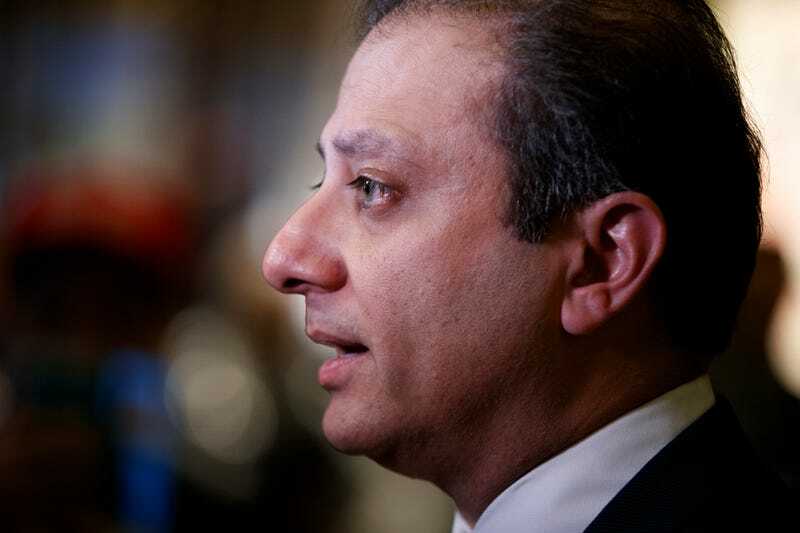 Bharara was fired just hours after he refused to comply with Attorney General Jeff Sessions’ order on Friday for 46 US attorneys (all the ones that had been nominated by the Obama administration) to resign, effective immediately. Bharara is a progressive attorney known for being a relatively aggressive prosecutor of corruption on Wall Street, and you might also remember as the guy who issued a subpoena for Anthony Weiner’s cell phone. The former US Attorney wrote that he’d been let go on his Twitter feed, which he only set up two weeks ago, perhaps in anticipation of this very moment. Is this standard behavior for a new administration? According to Buzzfeed News’ Chris Geidner and Zoe Tillman, new presidents tend to replace most US attorneys, but usually not so quickly, and not before successors have been nominated or confirmed. One of the attorneys who was asked to resign told Buzzfeed News anonymously that he didn’t receive any advance notice that resignations would be asked for so soon, nor did any of his colleagues, as far as he was aware. The Times suggested on Friday that, while Bharara will presumably be temporarily succeeded by his deputy Joon H. Kim, Marc Mukasey is one of a few names being floated to replace him. Mukasey is the son of a former Bush administration attorney general and works at the same law firm as Rudy Giuliani. I guess there’s nothing intrinsically good about having a job! This is a developing story and will be updated if and when Trump writes something inflammatory about it on Twitter.